*Note* this game review may contain possible spoilers. The Legend of Zelda: Ocarina of Time 3D is a remake of a Nintendo 64 classic. The original was amongst the highest rated games ever and proved to be very cutting edge for its time. The Legend of Zelda: Ocarina of Time provided a vast world to explore and many new challenges to undertake, all while being displayed in beautiful 3D polygons. The game was stunning to say the least, but will the remake live up to all of the originals glory and praise? The original Ocarina of Time had great graphics for its time; the 3DS remake has had a graphical overhaul. All textures are now smoother and more realistic. One example can be seen in my Dodongo comparison. The 3D effects add another dimension to the game. This makes running through Hyrule more realistic. I turned off the 3D completely in order to get a good comparison and all I can say is that there is no comparison. The game was obviously designed to look and feel better with the 3D turned on. It is truly a sight to see for sure. One last note about the 3D is to watch out for the leaves falling off the Deku Tree because they just might hit you in the face. Ocarina of Time 3D has new and improved gameplay mechanics. The touch screen controls are just superb overall. They add a layer to the game that simple analog controls have yet to do in my opinion. While you still control Link with analog controls (via the circle pad), the added touch screen capabilities of the 3DS really make the game feel alive. The gyroscopic sensor that controls the slingshot, boomerang, and other weapons is not only accurate but more efficient then the analog counterpart. You can easily go from running towards an enemy to taking him out with the boomerang. In case you do not know, the game features two quest; the normal quest and a Master Quest. The normal quest is the same one from the original but with revamped graphics and gameplay mechanics. The quest has an extensive array of objectives for the player to achieve throughout their journey across the magical lands of Hyrule. The main objective, being one that is a staple of the series, is to save the lands of Hyrule from the clutches of the antagonist, Ganondorf. Since this scenario has played out many times before, it proves to be very nostalgic for the gamer. The player has a vast world to explore freely, as long as they have the required items to navigate the areas, which provides for a wonderful experience and one that all fans will enjoy. The overworld map has many secrets to be found including: gold skulltula'€™s, heart pieces, and Great Fairies. Gold skulltula'€™s, being the key to a curse on the family in the House of the Skulltula'€™s, are hidden all throughout Hyrule and its many dungeons. They make a distinct sound whenever one is around, making it somewhat easier to find them. The player receives rewards as they progress through their mission to cure the Skulltula family. The rewards include: larger wallets, rupees, bombchu'€™s, and even a heart piece. As the player finds more skulltula'€™s, they will notice different members of the Skulltula family turn from being skulltula'€™s into humans again. This is the sign of a new reward being available. Heart pieces play an important role in the amount of heart containers that Link has throughout his journeys. It takes 4 pieces in order to earn 1 extra container. Like gold skulltula's, they are scattered throughout Hyrule and prove to be challenging to find at times. The player can earn up to 9 extra heart containers via heart pieces and this extra life can be vital to surviving some of the games more dangerous and challenging obstacles and bosses. They can be found in small chests or just laying around on platforms throughout Zora'€™s River. Great Fairies, which are located in Fairy Fountains throughout Hyrule, provide Link with new abilities and power ups. The player can learn 3 magic spells from the fairies including: Din'€™s Fire, Farore's Wind, and Nayru's Love. One fairy can even give Link a defense boost, thus making the player take half damage from enemies. While many of the perks from the fairies are not necessary to complete the main quest, they do prove very helpful and fun to use during the many tribulations that Link faces. Dungeons have always played an important role in the Zelda franchise and with Ocarina of Time 3D, it is no surprise that they return. The first dungeon, being Inside the Deku Tree, is a nostalgic classic. It features many different floors and obstacles. One such obstacle is figuring out how to navigate from floor to floor with all the webs blocking the way. This proved to be a very interesting concept and one that will be enjoyed time and time again. 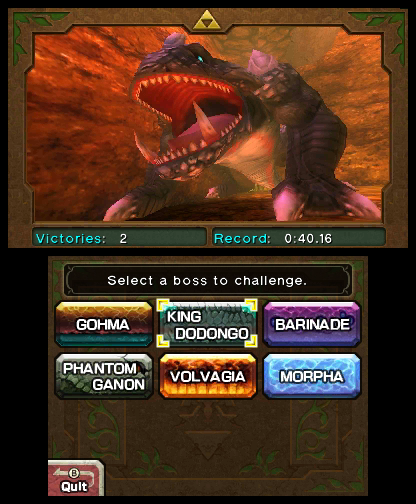 The second dungeon, being Dodongo'€™s Cavern, posed a significant different plethora of challenges. One had to use the newly acquired Bombs in ways that were intuitive and thought provoking. You had to have precise timing in order to achieve the necessary results to progress through the dungeons many passages. The third dungeon, being Inside Lord Jabu Jabu, was one that really pushed the envelope as far as puzzle'€™s go. 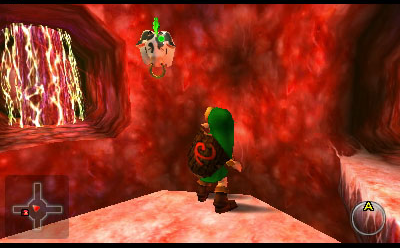 You had to use a partner, Princess Ruto, in order to navigate through many of the floors and rooms. Without Princess Ruto'™s weight bearing down on switches, Link would never have been able to cure Lord Jabu Jabu of his misfortunes. 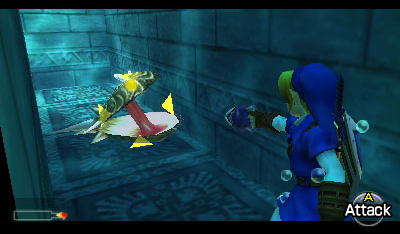 Princess Ruto also proved to be an obstacle all by herself, since she forced Link to carry her around much of the dungeon. You would have to constantly dodge enemy attacks and make precision jumps across pitfalls, all in order to help the demanding Princess find her lost stone, the Zora'€™s Sapphire. Now on to adult Link'™s troubles, while there were only 3 dungeons for kid Link, adult Link has 5 temples to conquer including several mini-dungeons. In the Forest Temple, where you get the Fairy Bow, Link must be able to master sense of direction and bow skills in order to conquer the many puzzle's that are presented. One such obstacle is a hallway that twists and makes adjacent room layouts rotate as well. As the hallway becomes straightened, the adjacent rooms pose different problems. Use of the Fairy Bow throughout the dungeon provides a true feeling of what it is like to live in a forest such as the one that Link and the Kokiri lived in. One more memorable temple is the Water Temple located in the depths of Lake Hylia. Throughout the temple, Link must rise and lower water levels according to which floors or puzzles he is faced with, thus making it relatively easy to become lost or disoriented. The temple does have some significant improvements over the original design in that there are guidelines that show you where each level's controls are placed. This helps with all the confusion and chaos that happens throughout the Water Temple. Overall, the dungeon and temple designs are brilliantly laid out and pose just enough of a challenge that players will be able, with some thought, conquer each and every one of them. The soundtrack of a game can provide a sense of emotion to a player and further their sense of connection with what'€™s going on within the game. Ocarina of Time 3D'™s soundtrack is the same one used for the original and provides much nostalgia for players who experienced it back in the Nintendo 64 days. From the iconic chest sounds to the sound of Link dying, players will feel a sense of danger or excitement with every move they make. One time when the sound really gets the player involved, is when battling a foe. The music quickly becomes more upbeat and full of excitement. It really gets you in the '€˜mood'€™ for a fight to say the least. Overall, the soundtrack is very nostalgic and provides a fuller depth for the game. Boss Challenge is a fresh new feature of Ocarina of Time 3D. It allows the player to engage in battle with every boss again. During each boss fight, the player only gets a certain amount of heart containers and gear, which are usually the basics that are needed to win the fight. This makes fighting some of the later bosses in the game more challenging because during the main game, the player could have 15 hearts for the boss fight whereas during boss challenge, the player might only have half as many. Master Quest has its own version of Boss Challenge as well. The bosses will deal out double damage in this version, which proves to be a great challenge in some cases. After defeating each boss again, the player has the chance to select '˜Gauntlet'€™ and here is where the real challenge pursues. Gauntlet allows the player to fight with each boss in a row, without recovery items or help in game. The only help the player gets is being able to choose a giant or small chest after each battle. The chests can contain a plethora of items ranging from heart containers and weapons to the no so helpful rupee. When players make a chest selection they are unable to open the other chest, thus the chime of two items is shattered. The player does not receive any heart recovery after each fight and must continue with only the bare basics. The Master Quest version is the ultimate challenge for fans everywhere. Just imagine fighting every boss in a row without recovery items or heart upgrades, adrenaline pumping right? The game also keeps track of the player'€™s victories and record times. Overall, Boss Challenge mode is a brilliant addition to Ocarina of Time 3D and one that fans will enjoy for countless hours. It is very addicting trying to see just how quickly you can defeat a boss. One record of mine, so far, is 30 seconds to defeat Gohma from Inside the Deku Tree. Granted Gohma is the first boss, I still think this is pretty quick. All fans will have great pleasure showcasing their abilities with Boss Challenge mode. While the Normal Quest proved to be fascinating, the new improved Master Quest is even better. Some changes include: double damage, mirror mode, and reworked dungeons. First off, double damage means exactly what it says; every attack from an enemy now does double the damage. The player will be faced with a plethora of new challenges with this change. During one dungeon, Link has to fight against 3 Stalfo'€™s, which can do 4 heart containers worth of damage. This proves rather difficult, especially if you are lacking in the heart pieces department, and provides a good challenge for anyone thinking the normal quest was too easy. Mirror Mode, which a comparison shot can be seen below, make all of Hyrule reverse. Where the player would have to go right normally, they now have to go left. This can make traveling Hyrule more confusing because the player will have the urge to go the normal quest directions, which are completely backwards. I found myself still heading west to go to Kakariko Village even after playing through the Master Quest for 20 hours or more. Reworked dungeons are another staple of Ocarina of Time 3D's Master Quest. Every dungeon poses new challenges and puzzles. One new challenge was in Lord Jabu Jabu where the player had to use the Fairy Slingshot in order to shoot cows hanging on the walls to advance throughout the dungeon, sometimes even having to shoot the same cow multiple times for the secret to be revealed. This led to a couple hours of running around and trying to figure out what to do. The Water Temple provided many new challenges as well. One room featured a platform on a cliff below the door and on the other side of the room, near the door the player needs to go through, was just a waterfall. The player had to turn around and find a slightly hidden switch above them in order to make targets appear. Even with these targets, the room was still hard to navigate because when you use the longshot to get to them, you would just fall off and be taken down into the abyss by the waterfall. Many secrets are to be found in this room alone, which provided a lot of thought provoking mysteries. Overall, master Quest proved to be very challenging and provided a fresh experience to a classic game. With all of the new puzzles, double damage, and being mirrored, Master Quest is a spectacle to behold and a quest that fans are sure to enjoy. It provides many more hours of enjoyment to the game and allows for yet another form of gratification after defeating the challenges.